About: From the age of 6 Dave was inspired by his grand father, an Organist & multi-instrumentalist with a house full of instruments. Clarinet, Piano & Violin became Dave's instruments & he took private & school lessons. Dave learned these instruments because they were available at home. The first time Dave chose an instrument, the Trumpet, he was 14 & already learning 3 others. His music teacher understandably refused to allow him to learn it. 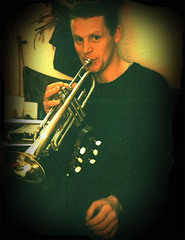 It would be 15 years later that Dave bought a trumpet & became hooked. It's now his main instrument. On taking his grade 5 theory at age 13 he achieved 100%. At the age of 16 he took grade 8 clarinet. He already had grade 3 violin & grade 5 piano. In his home town of Scarborough, he played violin in the School Orchestra & clarinet in the 40 piece 'EASY' band (Eastern Areas Schools Youth Band). After winning auditions in Manchester for the 'Schools Proms' at the Albert Hall & on TV, the Band took part in second round auditions in Croydon. It was a time of discipline & a masterclass in the art of playing with others. The EASY band was known thoroughout North Yorkshire for it’s disciplined approach to playing, because of it’s visionary leader Tony Turner & it's success. It finally did get to play at the 'School Proms' - though by then, Dave had left school.